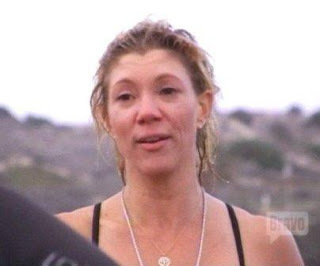 In season three, episode five of Work Out, Jackie Warner took her clients and the trainers on an out-of-town retreat. To the viewers, it was like watching Mrs. Voorhees and the camp counselors going to Camp Crystal Lake. Even without the Friday the 13th theme music, you would have to know that nothing good could come from it. With Jackie around a group of strangely unconcerned victims, there were sure to be a lot of hurt feelings and injured bodies lying around. At the beginning of the episode before the trip, Jackie continued to voice her hatred of Brian Peeler to anyone that would listen. It still infuriated Jackie that anyone had dared to stand up to her, especially a man like Brian. Of course, Jackie wouldn't want anyone to see that someone could successfully get her riled, so despite the fact that everything was captured on camera and despite the fact that all the trainers know what a tyrant she is, Jackie absurdly claimed that she handled Brian's firing "professionally". Such a statement is really beyond belief. It doesn't accurately show the kind of person that Jackie is, whereas her description of Shannon (Brian's Sky Lab partner that Jackie left in the lurch) as one her "pets", does. It's consistent with Jackie's treatment of people like animals. At least she reassigned Shannon to caring JD Jordan (who she told she had her (evil) eye on). 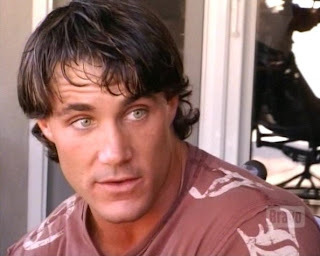 Greg Plitt, as a real stand up guy, spent some time with Brian to make sure he was okay. Greg told Brian that his standing up for his client while putting his job on the line showed real character. Greg also showed that he has a talent for analysis as he went on to say that Jackie attacks Peeler and her own friends for the same reason, that she is someone who has insecurities and who can't accept who they are so they have to belittle others. That's a pretty good observation. There's no better group to belittle than a captive audience, so Jackie decided to take her Sky Lab clients to a retreat outside of L.A. She claimed she wanted them to have A life changing weekend. Much more likely was that she wanted to have an out of town trip that she could claim as a business expense and where she could cause maximum misery. The Sky Lab trainers and clients traveled by bus to the Dolphin Bay Hotel and Residences. During the trip Jesse Brune acted as if he was about to kiss Jackie and she pulled away while joking about having cold sores. Jesse politely laughed in order to get along. After they arrived and ate dinner, Jackie told only the trainers that the next day's activities would start at 5am. She could have told the clients as a courtesy, but her cruel streak wouldn't let her. "There will be tears!" she gleefully uttered. The next day, Jackie overexerted the clients and particularly relished having obese Deenie walk on her injured ankle. When Deenie stated that she needed water, Jackie ridiculed and castigated her for being dehydrated. Deenie went and got water even though Jackie didn't want her to. It was nice to see Deenie stand up to the witch and also nice to see the Propel brand water bottles obscured after that advertiser couldn't take supporting such a vile person like Jackie after the bad treatment of Jamie Eason. By the way, is anyone else tired of hearing any kind of exercise session or physical activity called a "boot camp"? I guess I'm having a finger boot camp on my keyboard right now. At the end of the episode there was a group therapy session where the consensus of the group was to try to destroy whatever hint of self-respect Deenie still had for herself. There was an obvious desire by some of the clients to build themselves up by insulting her, especially super loser Micah. I gained new respect for Deenie for being able to withstand the abuse that was heaped on her and respect for Natalie for caring for a fellow human being rather than joining in the mob mentality. On the other hand, if possible, I lost even more respect for Jackie as she sat back and let it happen. It was disappointing to see Jesse Brune join in the schoolyard taunts of Deenie and her weight problem. No man is perfect and it appears that Jesse's weakness is to go along with other people rather than standing up for what's right. I assume this behavior may have been caused by a feeling of being left out in his youth and now he goes out of his way to be part of the group. Since Natalie showed that she is willing to protect others even when it is not popular, I hope this is something that she can help her partner Jesse learn to be better at.